Earlier this year I bought a few bits and pieces from plus size fashion brand Pink Clove. One of the items was a dress I’d had my eye on for a while: the Colour Block Dress. I’ve long been a fan of Pink Clove’s skater dresses, so I hoped this one would be every bit as good. However, when I was placing my order I found that the smallest size available was a 20. I suspected this would be too big for me but I went ahead and added it to my basket anyway. These photos were taken back in the summer when I was staying at a hotel as I was working away from home. For reference, I am wearing my Ewa Michalak S Tęczowe Kfiaty bra 32KK/70KK in these photos, along with some cropped leggings from Forever 21+ and shoes from Crocs. 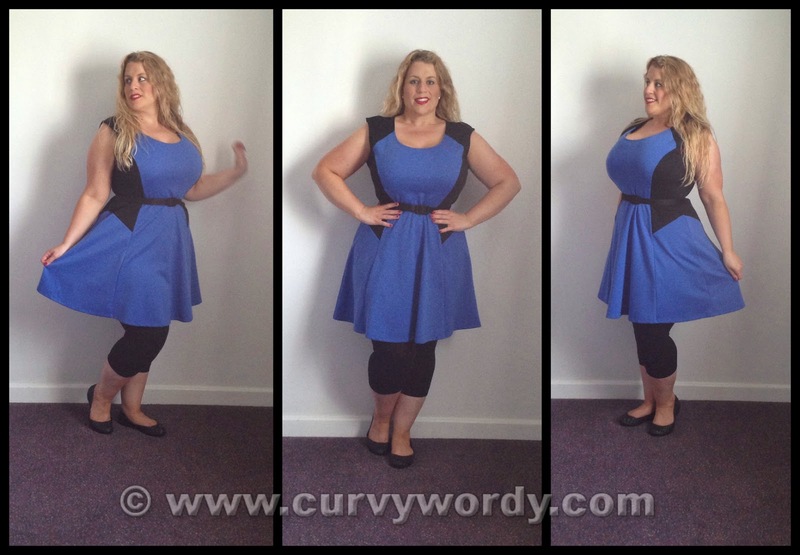 I fell in love with this dress straight away – the hue of the blue is so, so lovely. It’ll come as no surprise to you to learn that this quickly became one of my go-to dresses in the summer. Although the dress is made from a fairly thick stretch ponte fabric, the fact it is sleeveless made it perfect for the warmer months. I couldn’t believe how much better this dress fitted! Yes, it’s a tad snug on the bust, but it fits so well everywhere else. There’s not tons of extra fabric on the waist or at the back. I could almost get away without adding a belt but as the dress has belt loops it makes sense to keep one on. I don’t use the extremely thin patent belt that came with the dress; but instead I add a slightly wider one from one of my Pinup Girl Clothing Heidi dresses. I have also teamed it with a tiger print belt on occasion, which has worked really well as a different look. The dress works really well with either leggings or tights, and it looks great with a plain black shrug to make it suitable for wearing in colder months. The length of the skirt is short-ish, as it reaches above the knee on me (I am 5’5), but it’s not so short that it feels indecent. I really like the scooped neckline of this dress. It’s fairly low, but somehow it doesn’t show an excessive amount of cleavage, so it remains work appropriate. The armholes are cut very well and don’t show my bra straps, and the fit of the upper body on the back of the dress is particularly impressive. 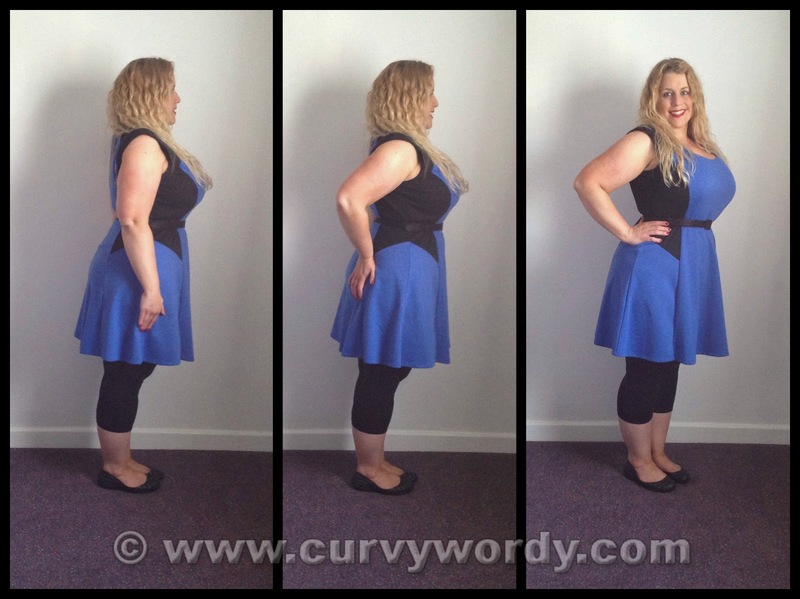 Often plus size dresses can be cut with huge armholes – and I’ve never fathomed why this is! – but Pink Clove have got the perfect cut here. My bra straps don’t show at the back, and nor does that area of flesh between one’s bra strap and armpit. I’ve just checked the Pink Clove website and I’m afraid it looks like this dress has now sold out. If you’re looking to buy one, it might be worth checking on eBay every so often, and of course keep an eye on the Pink Clove website as you never know if they might restock it or bring it out in different colourways. I’d love to see it in red with black side panels, and also in white with deep purple side panels. What colours would you like? Thanks, Scarlet. Blue is one of my favourite colours, especially in a dress. Nice dress. They should definately make it in other color's. I think a white dress with electric blue panel's would be hottttt. White and electric blue = WOWWWW!!!! Thank you, and yes it is a shame it's sold out. I hope they will restock or bring it out in other colours. The blue looks so perfect on you. I really like this dress and it's design. I would like it in red with black panels. Do you know if Pink Clove are planning on going ahead with bringing this out in other colours? I really hope so!!!! Ooh I really like the sound of that! I hadn't thought of prints, but what a fantastic idea!